For IE6, press ALT+V → X → (G) max. (L) large (M) medium (S) small (A) min. to choose a font size. For IE7 or Firefox, press Ctrl+ (+) or (-) to change the font size. Currently being repaired due to damage caused by a recent typhoon, the Oyster Shell Island is closed for now. We apologize for any inconvenience caused. Press [Enter] to skip this sub-menu. To continue, press [Tab]. To people who live by rivers, bridges are probably the most important transport facilities. It can take a staggeringly long time to commute without bridges. Manzhou's Gangkou Bridge is the longest pedestrian suspension bridge in this area. 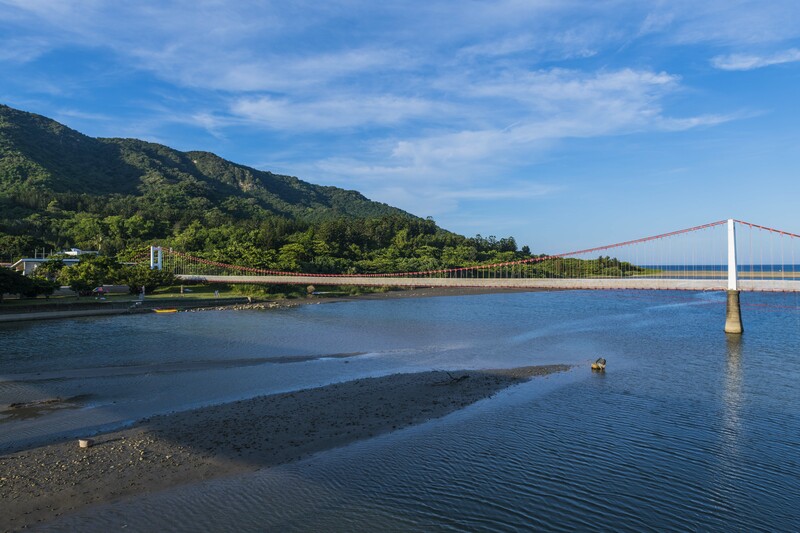 From afar, one can see the red and white bridge crossing Gangkou River. Both sides of the river are adorned with verdant trees. This scenic river is perfect for taking a rest or doing leisure activities. People often come here to row boats. Let’s learn about Wen Wangye! Copyright Dapeng Bay National Scenic Area Administration, Tourism Bureau All Rights Reserved.